Norcliffe Chapel is a historic Unitarian chapel set in an attractive garden within Styal Village and close to Quarry Bank Mill. It is a very popular choice for weddings. Who Can Marry at a Unitarian Chapel? Whether you are single or divorced, of mixed faith or no particular faith, you can be married provided you are legally free to marry and the minister is convinced of your sincerity, your commitment to each other and your reverence for the vows you will be making. You do not need to be a formal member of the chapel. However, it is the law that you must declare that this chapel is your normal place of worship, and to qualify for this you will need to attend our services on a regular basis before your wedding. You are required to sign a book to record attendance at the chapel each time you attend a service. This is our legal proof to the Registrar's Office that this is your normal place of worship. There is no one "standard" Unitarian wedding service. Every wedding has a similar overall structure but it can be adapted by the couple and the minister to best reflect the particular character of their relationship. There are certain words that are set by the legal requirements but the ceremony will be personal and may contain a choice of music, readings and words of commitment. The best way to get more information about marriage ceremonies is to contact the wedding secretary, Natasha Stanley (telephone 07401 872137 or use the contact button below), for an informal discussion. The wedding secretary will take a few basic details, including the proposed date of the wedding and invite you to a first meeting at the chapel on a Sunday after the 6pm evening service. This first meeting must take place before a firm booking can be made. At the time of making a firm booking you will be required to pay a non-refundable deposit. Once a date for the wedding is agreed you will be asked some questions about the ceremony you would like and related arrangements. You might like to give this some thought in advance. The minister, Reverend Alex Bradley, will then help you create your wedding by suggesting appropriate texts, readings, poems and prayers, or help you choose from your own sources. At a further meeting with the minister you will finalise arrangements and this may be followed by meeting to talk the wedding through in the final weeks before the ceremony. Our motto is "no surprises"! During this time the minister will keep in touch with you and by attending the Sunday services you will get the opportunity to get to know the minister, organist and other chapel members and to become more familiar with the chapel. 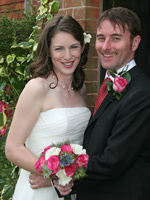 Once a date and time for your wedding has agreed in consultation with the chapel wedding secretary, approximately two months before the the wedding date you must ensure a Marriage Certificate is obtained from your local office of Births, Marriages and Deaths (Registrar's Office) for both parties. At you meeting with the wedding secretary you will be given a leaflet ("Legal Requirements and Fees for Your Wedding") detailing this process, the documentation needed, who to contact and the fees payable to the registrar. This leaflet will also detail the fees for a wedding at Norcliffe Chapel. The chapel organist, Alan Mysercough, is available to play at weddings and this is included in the wedding fee. Alan is available after Sunday services or by appointment. If you wish to bring your own singers or musicians or wish to use your own recorded music and sound system, please discuss this with us in advance. There is a microphone and speaker system in the chapel but you are responsible for ensuring any equipment you use is compatible and it must have a valid PAT test certificate dated within the last 12 months. You may supply your own flowers, either arranging to bring them to the chapel one and a half hours before the wedding, or phoning the Caretaker, Margaret Ryder (telephone 01625 529838), who may be able to provide access on the Thursday before your wedding. We can supply covers with a picture of the chapel at a cost of 30p each. Can another minister (e.g. a relative of a family friend) be involved in the service? Other ministers may give a reading or blessing or speak at some point during the service but Norcliffe Chapel's minister conducts the service as a whole. This is something to discuss with the minister when making the arrangements. Are photographs allowed in the chapel? Photography is allowed but flash photography is not permitted. Are we allowed to have someone video the ceremony? Video is acceptable provided the operator stays in one place and the video is not used for commercial purposes. Can we have a peal of bells? The chapel does not have a peal of bells but you may have the bell rung in celebration, which is included within the wedding fee. How many guests can the chapel seat? The chapel can seat a maximum of approximately 120 people. This is the limit for comfort and safety considerations. Only the formal cars for the main wedding party and for disabled guests my drive up to the chapel's lych gate. Guests are asked to use the National Trust car parks in Styal Village or park on Altrincham Road. Please throw confetti outside the chapel grounds i.e. beyond the lych gate. We ask that any confetti used is biodegradable and not metallic as this is a danger to nearby grazing livestock. Send a message to Natasha Stanley using the button below or telephone 07401 872137.